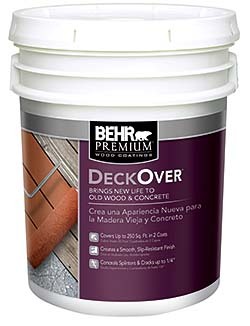 The Premium Deckover® is formulated for weathered wood and concrete surfaces. The coating features 100 percent acrylic resin fused with ceramic microspheres and is mildew resistant. The product covers up to 50 square feet in two coats, concealing splinters and cracks up to 1/4-inch wide with a slip-free finish that resists cracking and peeling. The solid color coating offers 54 custom color options.